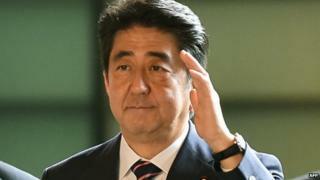 Japanese Prime Minister Shinzo Abe has brought five women into the cabinet in a reshuffle, while retaining ministers in key posts. The move means women now hold seven of the 18 cabinet posts, equalling the previous high set by Junichiro Koizumi's cabinet in 2001. Mr Abe says better use of women's skills will help economic revival. Taro Aso remains in place as deputy PM and finance minister, while Fumio Kishida stays as foreign minister. Defence Minister Itsunori Onodera will be replaced by Akinori Eto. The new line-up was announced by Chief Cabinet Secretary Yoshihide Suga, who also kept his post. Mr Abe said in a press conference: "Realising a society where women can shine is a challenge our cabinet has undertaken... I look forward to the wind of change these women will bring." He said a "positive economic cycle is kicking off". "We're only halfway through in reforms and we need to deal with new challenges. I reshuffled my cabinet so that we can tackle these challenges boldly and vigorously," he said, adding that the biggest issue was reviving some regions of Japan. The reshuffle is the first significant rejig since Mr Abe took office in December 2012 after a landslide election win. Support for his government has since fallen, partly because of the recent rise in consumption tax. Mr Abe has in the past described women as an "under-used resource" in Japan. Last year he set a goal to increase the percentage of women in leadership positions to 30% by 2020. Experts also believe that persuading more women to remain in the workforce - either by better accommodating working mothers or by offering better opportunities for promotion in a traditionally male-dominated society - could help ease looming labour shortages caused by Japan's low birth rate. In Mr Abe's previous cabinet, women occupied two of the 18 posts. Among the new female entrants is Yuko Obuchi, the daughter of former leader Keizo Obuchi, who takes on the economy, trade and industry portfolio, while Midori Matsushima was named justice minister. What Mr Abe has done is a significant step but the appointments mask a much deeper problem in Japanese society, says the BBC's Rupert Wingfield-Hayes in Tokyo. Currently only 39 of the 480 MPs in Japan's lower house of parliament are women, the lowest by far of any developed country, our correspondent adds. In a parallel reshuffle, two lawmakers with good links to China, Sadakazu Tanigaki and Toshihiro Nikai, were appointed to top ruling party posts. Video Could women be the key to turning around Japan's economy? Japan: Worst developed country for mothers?